Horror fans (or anyone else, for that matter) can currently pick up a modern classic of the genre for free on the Humble store. The Amnesia Collection is available for absolutely nothing until tomorrow. 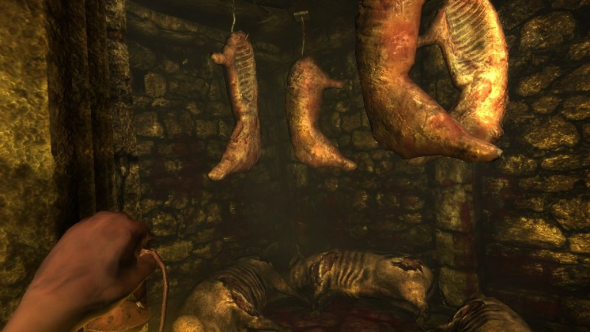 The collection, which is normally priced at £26.99 on the store, contains both 2010’s Amnesia: The Dark Descent, and its sequel, A Machine for Pigs, which came out in 2013. The first of the pair is probably the sweeter deal, as it still has ‘overwhelmingly positive’ ratings on Steam, more than seven years after release. The first person survival game takes you to a desolate castle and plunges you into the darkness, tasking you with making your escape while making sure you don’t lose your mind. A Machine for Pigs didn’t quite live up to the success of its predecessor, with only ‘mixed’ reviews. It was, however, developed by developed by The Chinese Room, the team behind Dear Esther and Everybody’s Gone to the Rapture. It’s also, you know, free, so it’s got that going for it. If you want to grab the bundle for free, you have until 18:00 GMT tomorrow, January 27, to pick them up.